Mirta Martin, candidate for UM President speaks during a campus visit September 18, 2017. 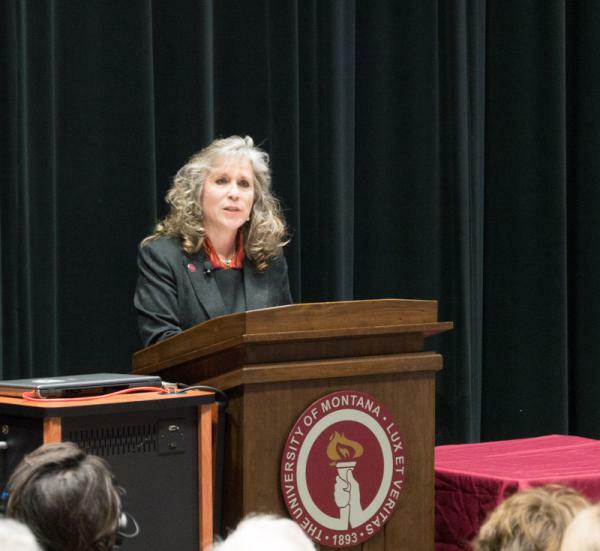 The University of Montana has narrowed its search for president down to four candidates. The finalists are on campus this week and Monday, visiting with faculty and students and sharing their vision for the institution, which is facing enrollment challenges. Mirta Martin was the first prospective president to participate in an open forum held at the UC Theater Monday afternoon. Martin has a background in both higher education and banking, and she most recently served as president of Fort Hays State University in Kansas. With her experience in both the public and private sectors, she stressed, "That I bring the best of two worlds: appreciation for and a commitment to research, to teaching, to an education grounded in the Liberal Arts, and to shared governance. And that I bring the strategic, outcome-driven, financially savvy and transparent mindset of a CEO." She acknowledged that UM has had to make big cuts to deal with declining enrollment and its urgent budget crisis. But Martin also said that, "The time has more than come for this university to identify opportunities and implement sound strategies to grow its way out of our current situation. To create new and external sources of income to mitigate the cuts." Martin’s ideas include building new markets, strengthening public-private partnerships, launching a capital campaign, and graduating students that are strong in science and technology as well as the humanities. The next open forum with finalist Andrew Hale Feinstein will be on Wednesday, September 20 at 3:30 p.m. in the UC Theater.